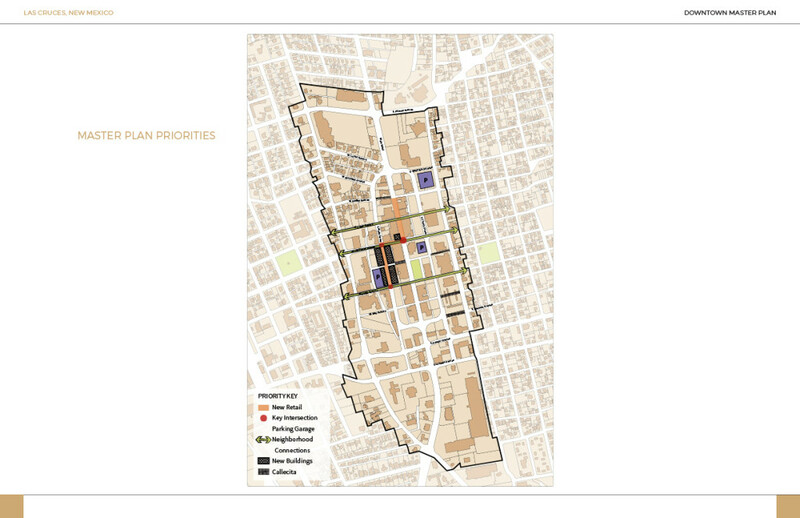 In her presentation (32mb .pdf), Susan Henderson, project manager for the PlaceMakers consulting team referenced the foundation laid by nearly three decades of Downtown planning. 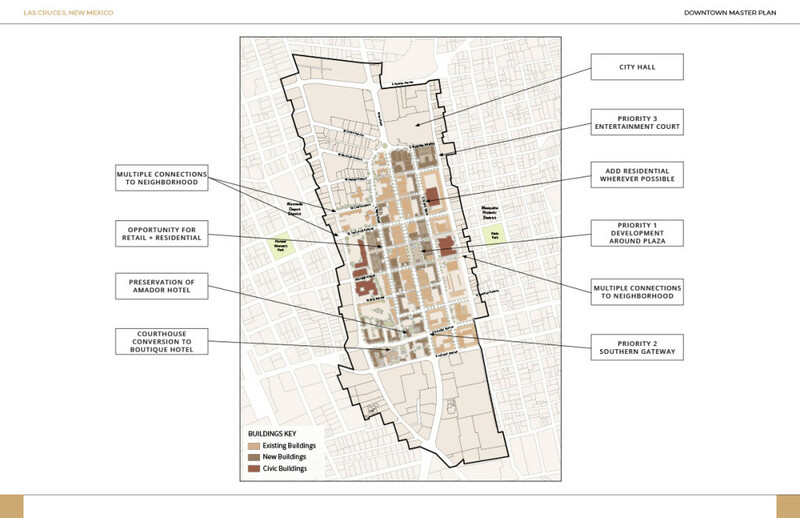 Big picture goals of a more lively and prosperous Downtown remain. As does the commitment to assuring inclusion of the adjoining historic neighborhoods of Mesquite and Alameda Depot in the planning. The current effort has been an exercise in affirmation and continuity, just with an added incentive for accelerating the process. What the four days of discussion and design-testing made clear is the opportunity presented by pent-up demand for both commercial and residential development. 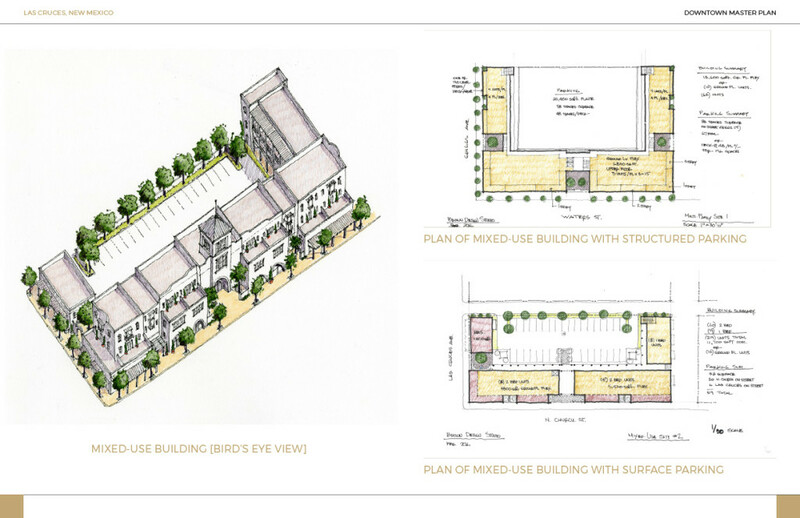 For instance: According to market analyses commissioned as part of the Plan update process, there’s immediate demand in the area for some 250 apartments and almost 105,000 square feet of retail. (You can find those reports here). Since numbers like those are likely to attract developers, including many who might prefer addressing that demand in outlying areas, they suggest a heightened sense of urgency for Downtown planning and implementation. If the demand is absorbed in suburban regions, hopes for significant improvement in economic development and quality of life in the Downtown and adjacent neighborhoods could be delayed — or even dashed — for a generation. The team’s suggestion: Ramp up the effort by concentrating the development focus in the short term on sections of the Downtown that are the best candidates for incubating a critical mass of walkable, mixed-use development that inspires broader private sector investment and public-private partnerships in the long term. Take a look at the two maps below that indicate high-priority strategies. The first lays out a broad vision incorporating present conditions and longer-term goals (click for larger view). The second calls out specific initiatives that can be applied in the identified target areas (click for larger view). The first priority may be the easiest to fix: Begin eliminating barriers that inhibit connectivity between the Downtown and Mesquite and Alameda Depot. Restoring safe, walkable access to and from the neighborhoods not only increases the likelihood of more customers for new retail and services in the Downtown, said Henderson, “it’s an equity issue.” Crumbling sidewalks, dangerous street crossings and the lack of shade trees prevent those with the greatest need for pedestrian access — the very young and the very old — from fully participating in the broader community. 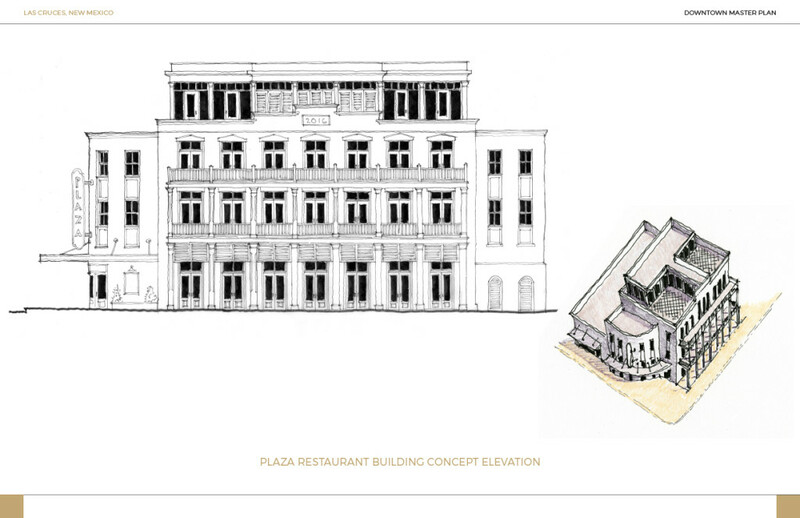 The second recommended priority is to support the soon-to-be-completed Plaza with new development and redevelopment, adding restaurants, residences and other active uses that enliven street life. 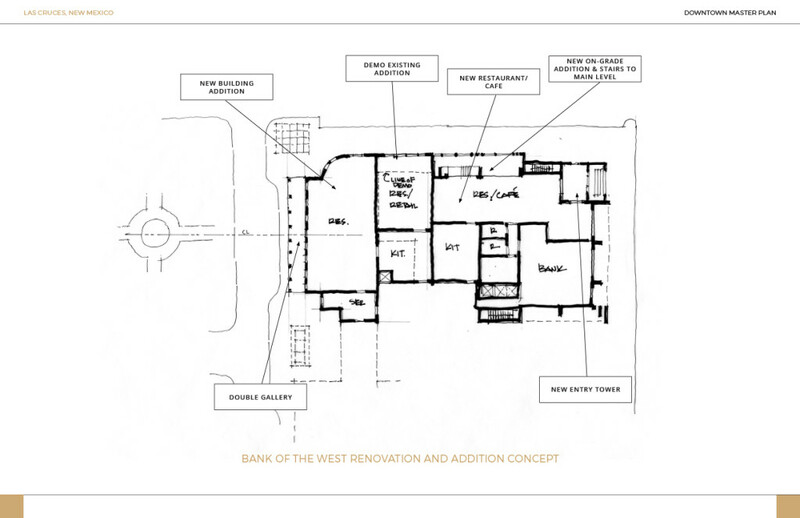 Here, for instance, is a depiction of Bank of the West concepts for renovation and additions that puts a new building on the space that faces the Plaza and reimagines the existing building to better address the corner of Las Cruces and Main. The idea is to maximize uses of the building (click for larger view). 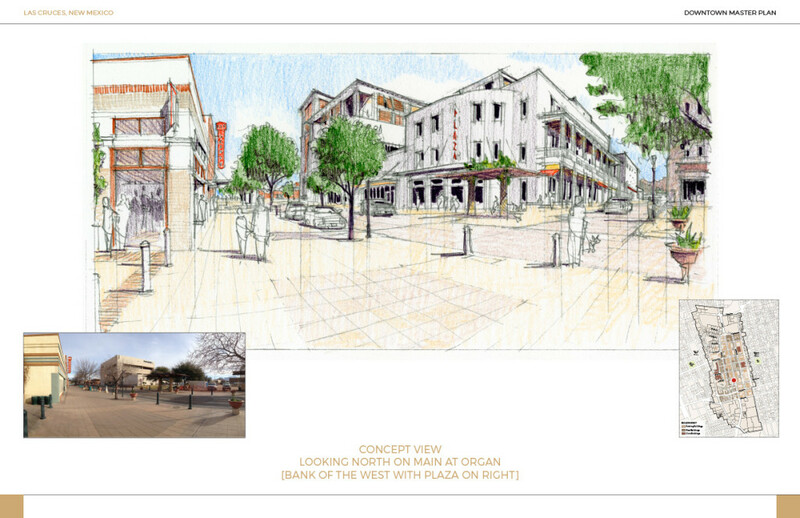 Below is the view looking south on Main at Las Cruces, which should become the epicenter of a reinvigorated Downtown. The renovated Bank of the West Building, with its corner tower addition, can be a visual anchor and iconic symbol for downtown Las Cruces (click for larger view). 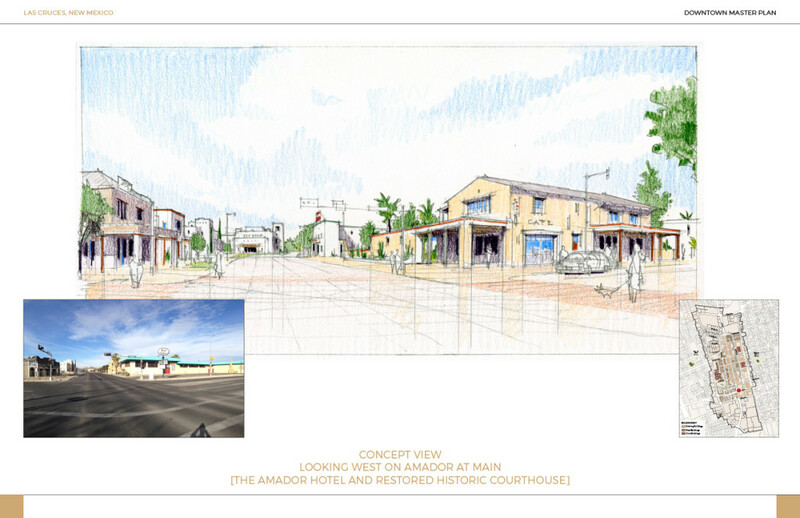 The third priority is to create a heightened sense of arrival in the Downtown by leveraging the appeal and stature of the historic Hotel Amador and County Court House. Here’s a view from above that demonstrates that connection and the potential for activating the spaces around them (click for larger view). 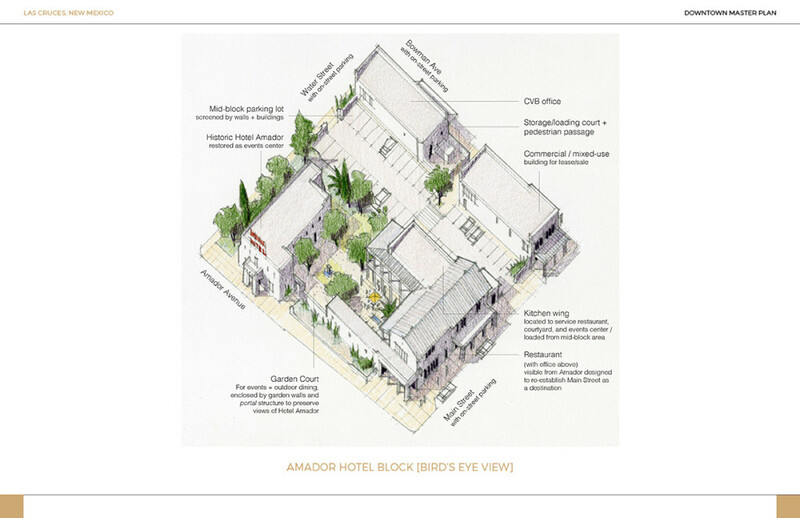 Below is a block redevelopment concept focusing on the redevelopment of the Hotel Amador as an event center and developing the rest of the block to address Master Plan goals (click for larger view). 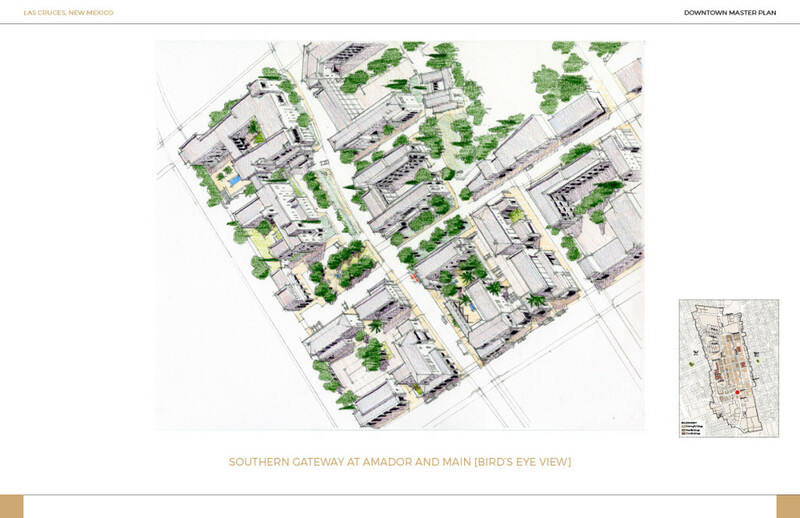 To see how development on both sides of Amador can be used to lead people Downtown, while preserving views of the Hotel Amador and the Court House, consider this illustration (click for larger view). While there has to be an effort to connect new development and redevelopment with architectural approaches that suggest structures understand where they are, there’s no need for a fierce debate over style. 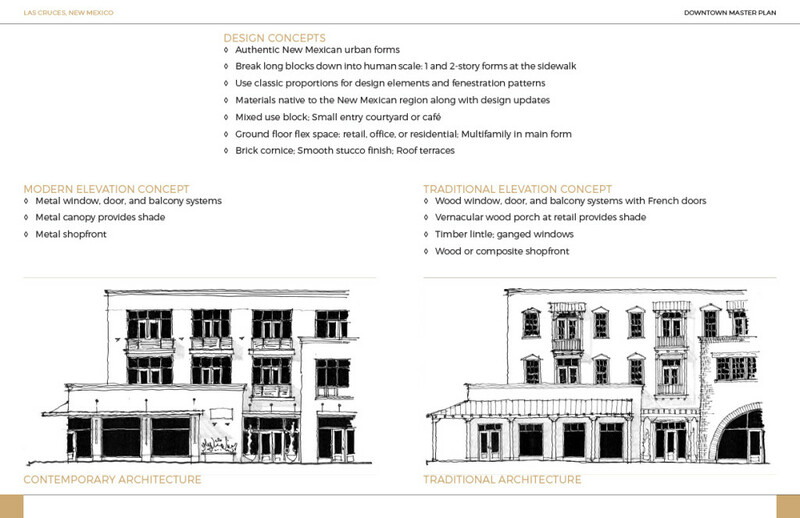 Below are studies of mixed use buildings rooted in the traditions of the region, and rendered in ways that hint at both traditional and contemporary styles. Combined with regional materials and detailing, these approaches compel an architecture which frames an authentic sense of place (click for larger view). With demonstrated demand for multifamily residential development, here are strategies for apartments at two density levels, both preserving a sense of scale appropriate to the percentage of a block they might occupy. The lower density example provides surface parking in the rear. The larger complex arranges housing around an interior parking structure (click for larger view). You can follow each step of the process leading into the February 19 presentation and discussion in the posts preceding this one. And while the Friday night event wrapped the four-day workshop, it didn’t mark the last chance for community review of the ideas and proposals. Check this video to hear about next steps in the process that will lead to the City Council’s consideration of a final draft of the Master Plan. Moving forward, be sure to watch this space — and the City’s website for schedules of meetings. Thanks to all for a lively and useful four days. Glad to see these plans come together. It would be great to figure out what the http://www.infillscore.com is and to then use the free planning & infrastructure roadmap tools to add to the great foundation of work already completed.